Today we are going to catch up with our Investment Trust Portfolio, and look at another published portfolio for ideas. Since then, we picked up an extra property trust for the main portfolio, as part of a review of some Investors Chronicle ETF portfolios for income. 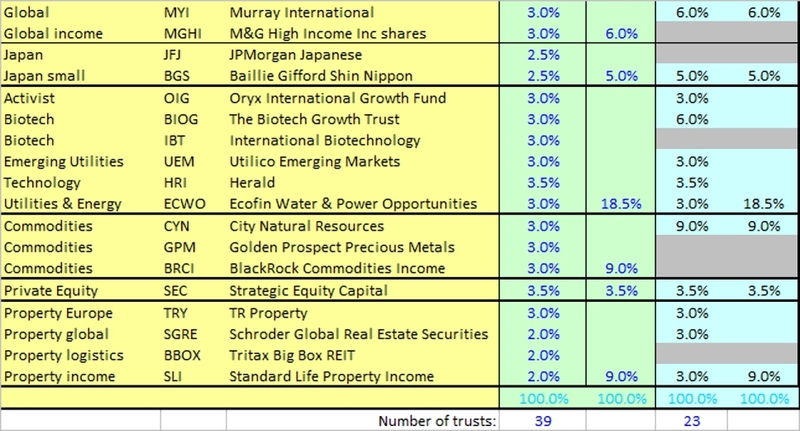 So the main portfolio now has 37 trusts, out of a maximum of fifty. The portfolio has a weighted average ongoing charge of 1.28% (a far cry from the 0.35% of the ETF portfolio) and a weighted average quality score of 16.6. 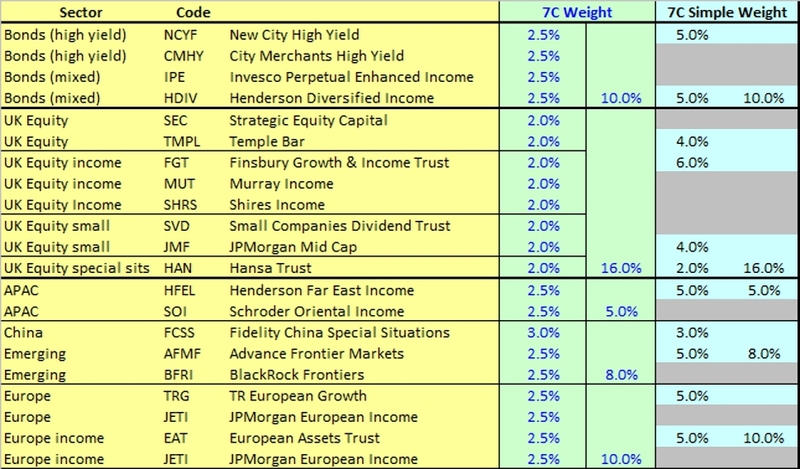 The “simple” 23 trust portfolio has an ongoing charge of 1.27% and an weighted average score of 17.0. The obvious gap is US exposure. The MoneyWeek IT portfolio dates back to June 2012, when Merryn broke a promise to herself never to build a model portfolio. The risk of choosing funds that didn’t do as well as expected was high, and her preference for long-term, capital-protection funds might seem dull to the magazine’s readers. Each member chose five trusts, and Merryn chose which made the grade. Murray International (MYI), which is already in our portfolio. 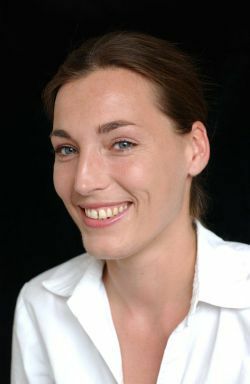 It’s run by Bruce Stout, who Merryn describes as a realist. Unfortunately MYI stood at a premium of 8% in 2012 (it’s now at 6.5%). Edinburgh Investment Trust (EDIN), run at the time by Neil Woodford, but standing at a premium of 3%. Merryn didn’t approve of the tobacco exposure, either. The smaller sister to EDIN, Perpetual Income and Growth (PLI), is smaller and has more flexibility to invest in mid-caps. Biotech Growth (BIOG) is already in our portfolio. Standard Life European Private Equity (SEP) was at the time on a 40% discount to NAV. F&C Commercial Property (FCPT), based mostly in London and the southeast, with an “attractive yield”. Law Debenture Corporation (LWDB). This “combines a diverse investment portfolio of mainly UK shares” with a stand-alone trustee business. The dividend was 3.7% and the total expense ratio (TER) was over 0.5%. The apparent premium of 8% reflects the the fact that the trustee business is not included in the NAV. Merryn thought all these funds were good, but preferred not to have a portfolio of 16 trusts. Personal Assets Trust (PNL) – big, liquid and with a a discount defence strategy so that it trades around NAV. “With its emphasis on absolute returns, wealth preservation and zero discount policy, we see this as a core defensive holding.” It holds cash, inflation-linked government bonds, gold and conservatively managed large stocks. BH Macro (BHMG) – effectively, the Brevan Howard Master Fund, a defensive US-based hedge fund, inversely correlated with equity markets. Scottish Mortgage (SMT) – Baillie Gifford’s largest trust (£1.6bn) focuses on companies with long-term growth potential. It is also cheap (TER around 0.5%). Finsbury Growth and Income (FGT) is already in our portfolio. Managed by Nick Train, it’s a concentrated of around 25 holdings, with low turnover and a discount control policy to keep kit trading around NAV. There is a performance fee however. 3i Infrastructure (3IN) – a “more absolute return income-generating pick” with 5% plus yield. This fund invests in operating assets rather than contracts. RIT (RCP) – chaired and part-owned by Lord Rothschild, with a good long-term record, but not so good short-term one. Investments are diverse (including listed firms, hedge funds and private equity). So that gives us thirteen of the sixteen funds to investigate. There were no changes to the portfolio at the first update, though at least some members of the panel expressed doubts about most of the trusts. This takes the number of funds for us to investigate up to eighteen. At the second review, BH Macro was replaced by Caledonia Investments (CLDN), which invests internationally in quoted and unquoted companies, and was trading at a 20% discount. We now have twenty-four trusts to investigate. This is the most recent update, so it’s time to look at some tables. There were no changes to the portfolio during the August update, and no new alternative trusts were discussed. We still have twenty-four trusts to investigate. 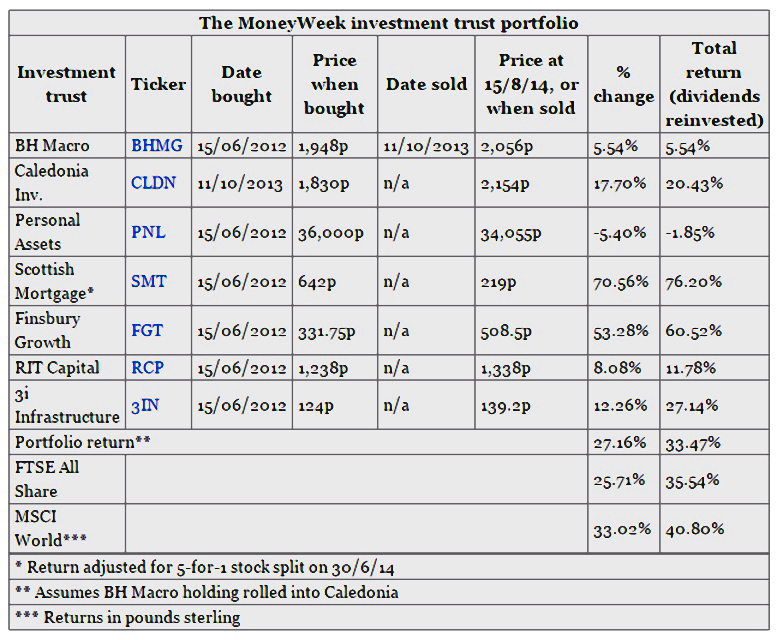 After all that data entry on our existing portfolio, it was a relief to find that the MoneyWeek IT portfolio held only 6 trusts, and had only ever held seven. Unfortunately / fortunately, after reading through the discussions, we now have 24 trusts to look at. This analysis will have to wait until next week. Our portfolio as it stands is shown below, with some of the less important columns removed for legibility.